In some applications the gain provided by single stage op-amps is not sufficient. In such circuits two stage op-amps are used. 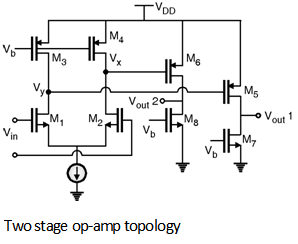 The first state of the op-amp provides the required large gain and second stage gives the large voltage swings. Figure below shows the simple two state op-amp circuit. Vout2 = gm6 (r06 || r08) V x.